After many months and not many neji of tenten episode do u still love them? Who do u think would win most kutest couple? What should Tenten do best for Neji? Does Neji love Tenten of Hinata? hallo kan any1 tell me if I ever geplaatst the nejixtenten=love part 10?? I knt seem 2 find it. I'm wondering if I 4got 2 post it but it was when Temari and Shika was sappose 2 b getting married but Tenten went into labor. Let me know. DIS IS URGENT!! Lol. Plz tell me y sum ppl think that Tenten's eyes r BROWN!! Then r not brown. They r in between gray and green. Plz correct me if I'm wrong. Which I'm not!! Y do u guys instist on kalling her eyes brown??? Tell me plz. Do think in a last episode, Naruto and Hinata will get together and Neji and Tenten would go together? do u think negi was go @ hiding his feelings 4 ten ten? Hi ._. I haven't been writing alot lately. Tenten went to a cheap mexican restaurant with Neji. She LOVED Her Cheesy Filled Nacho's. Every bite she take , She smiles and taste's the heaven. Soon Neji was HUNGRY. He wanted to eat Tenten Alive!. She loved him so much! That She Gave him ONE Nacho. THEY DIED OF BOREDOM AND GO THROWN TO A RIVER. Lee's mind: Why were they kissing and why is Neji's overhemd, shirt off, I mean he wouldn't even dare to let us catch him using the toilet. 1) Neji was forced to do it 2) Something happend that needed cloth and knowing him, he dosen't bring much stuff in his pack for light traveling 3) something is going on with him and tenten. "Is something going on between u two?" Tenten: ahh! 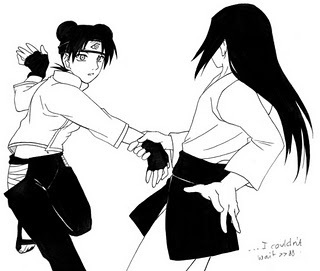 [blush] Neji why don't u have a overhemd, shirt on? Neji: it's me, lee and gai are discussing the mission with Genma right now let's go! Neji: in that case please let me in, it's burning hot out here! Neji: [blush] waah Tenten, your in a towel! Tenten's mind: OMG he's right gosh I didn't notice. "[blush] umm... That's cuz I just got out of the douche :p"
Okay so its been a couple of years since I've written anything, ! Sorry, shoot me, but I forgot about fanpop, . Hehe, . I'm only doing this for nejiten2 doe, . I know she missed me, . Okay sooo here goes, . P.S- there's a mall in this story, . After work I waited for Neji on the bench outside of the store. He was taking long but I guess thats what comes with being a manager. "Hey Ten what's going on? What are u waiting for?" If u would like u can kom bij this club! I made it. Is anybody here still upset that Neji died? of that Obito didn't revive him? of that Kishimoto actually have the nerve to actually KILL Neji?! Why not kill off-Idontknow- SASUKE?! a comment was made to the poll: What should Tenten do best for Neji? a comment was made to the poll: Does Neji love Tenten of Hinata? There is nothing to it, Hmph!